Hibernian have signed midfielder Kevin Thomson as a player-coach until the end of the season. 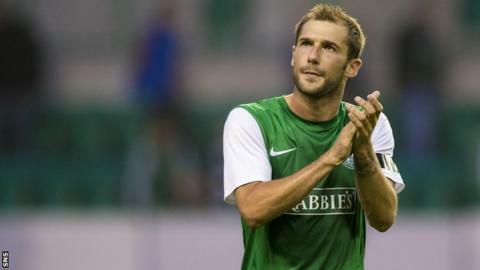 It will be Thomson's third spell at Easter Road and is head coach Alan Stubbs' second signing of the week, with striker Anthony Stokes joining on loan from Celtic. The 31-year-old was a free agent after asking to leave Dundee on Friday. "Kevin and Anthony have won league and cup medals and that experience will be important in the run in," said Stubbs. Thomson started his career at Easter Road before leaving for Rangers in 2007. He returned briefly in 2013 after a spell at Middlesborough but was one of a number of players released by then manager Terry Butcher following their relegation to the Scottish Championship. How he will attempt to help Hibs reduce the five-point gap established at the top of the table by Rangers. "He'll also be a strong addition to Eddie's coaching staff - I'm sure the kids coming through will pick up a lot from Kevin," Stubbs told the Hibernian website. "I've got to thank the supporters, as well as the board, for their backing. "There's a very positive feeling about the place just now and we're doing everything we can to get back to the Premiership."